Some of the UK's most intriguing and influential buildings are strictly out of bounds. However, a few of them frequently open their doors to the public for intriguing backstage tours. Here are some of the best behind the scenes tours available in London. Following their 2012 move from the Television Centre to the Broadcasting House, the BBC now provides interactive tours of the new studios. Built in 1932, the Art Deco building was the UK's first-ever purpose-built broadcast centre. It was given a revamp between 2005 and 2012, resulting in a complete overhaul and the assurance that all the latest digital techniques are available. Welcoming visitors to explore the world behind the camera, the tour includes the chance to experience a camera's eye view of the studios and the shows that are being broadcast to the nation, such as the Six O'Clock News and Radio 1. 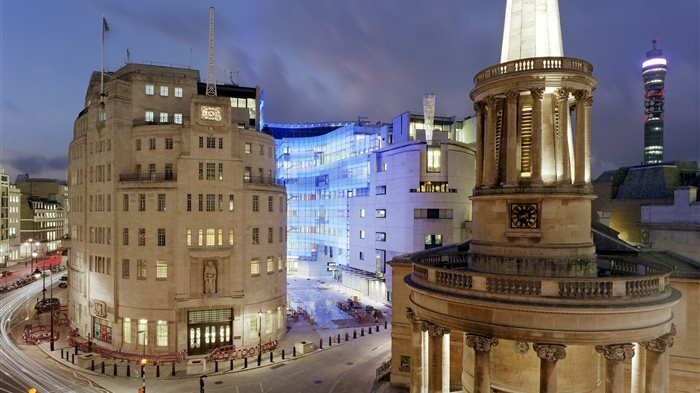 It also educates on the history of both the building and the BBC, creates a number of interactive opportunities, including reading the news and weather, and invites you to make your own radio play with music and sound effects. Dependant on production schedules, some of the tours showcase the newly restored Radio Theatre where Radio 2 concerts and shows such as Just a Minute, the News Quiz and The Now Show have previously been recorded. With tours taking place during working hours, each one is unique and there might even be the chance to spot your favourite breakfast DJ or news reader. For a more regal affair, Buckingham Palace invites the public to explore its nineteen State Tooms and 39-acre garden. Designed and built as the public rooms of the Palace, the State Rooms are where monarchs receive, reward and entertain their subjects and visiting dignitaries. The Queen and members of the Royal Family use them regularly today in order to receive and entertain their guests visiting on State, ceremonial and official occasions. During August and September, when The Queen takes her annual trip to Scotland, visitors can combine a visit to the State Rooms with a guided tour of the famous garden. The audio tour within the building is introduced by The Prince of Wales and leads visitors through the State Rooms and exhibition, giving a detailed guide to royal history and the works of art from the Royal Collection. It also covers the transformation of the Palace over the last 300 years and staff of the Royal Household talk about their work within the Palace. Highlights of the garden tour include the Herbaceous Border, the summer house and Rose Garden, and the Palace tennis court, where King George VI and Fred Perry played in the 1930s. Today the gardens are used for the Queen's garden parties and, known as 'a walled oasis in the middle of London', features more than 350 types of wild flower, over 200 trees and a three-acre lake. Exclusive evening tours of the State Rooms also run all year-round, inviting guests to enjoy the splendour of the Palace once the public have left for the day. The current stadium for London football club Arsenal, the Emirates Stadium gives Arsenal (or football) lovers the chance to see the venue up close and personal. Originally called Ashburton Grove before a 15-year sponsorship, the suitably slick stadium has a capacity of 60,365 and cost £470 million to build. With two tours available, visitors can choose between a self-guided audio tour or a legends tour. The self-guided option allows for visitors to roam freely and explore behind-the-scenes areas of the stadium. A host of Arsenal stars share their match-day experiences through the headphones, while the boss mentors you as you take your seat in the changing room and the crowd roar as you walk down the tunnel. The legends tour ensures a visit to the Emirates Stadium is truly unforgettable as a hero from the team's glittering past leads you, revealing his thoughts on his time in the game, the current team and any inner gossip from the Arsenal team. Among the legends taking tours are 1971 FA Cup hero Charlie George, Arsenal centurion and Double winner John Radford, 1987 League Cup winning captain Kenny Sansom, cult hero Perry Groves and legendary right back Lee Dixon. Home to the UK's oldest wisteria, planted in the early 19th century, the Fuller's Brewery in Chiswick - formerly known as the Griffin Brewery - has been brewing beer for more than 350 years. Providing the chance to discover the secret recipe of Fuller's ales and learn about its heritage, up to twenty tours are held at the brewery each week. As well as giving an insight into how the beers are made, from the arrival of the raw materials to the packaging of the beer on the cask racking line, there will also be the chance to indulge in a refreshing tasting session of the company's famous ales. Another option is to choose the Vintage Ale tour, which includes a complimentary bottle of Fuller's 2005 Vintage Ale. One of the world's most iconic buildings is The Palace of Westminster, more commonly known as the Houses of Parliament. From its beginnings in the 11th Century, when Westminster Hall was used for meetings between the King and his Council, the Palace has now transformed into the home of a 21st century democratic Parliament. The Houses of Parliament offers guided tours of the premises, giving visitors a unique insight with a combination of history, politics, art and architecture. Running every Saturday and on weekdays during the summer period, the tour commences by taking visitors on the processional route taken by The Queen every year at State Opening of Parliament: from The Queen's Robing Room, through the Royal Gallery and Prince's Chamber, into the Lords Chamber. The journey then continues through the Peers' Lobby and Central Lobby, the meeting point of the Lords and Commons. During the visit to the lobbies, visitors will be educated on the voting process and will then enter the Commons Chamber. The tour concludes in the historic Westminster Hall, where trials such as William Wallace and Guy Fawkes have taken place. More recent times have seen world leaders such as Nelson Mandela and Barack Obama address the Houses of Parliament from the steps of the hall. Home to The Royal Ballet and The Royal Opera, the magnificent Royal Opera House opens its doors for unprecedented access to the iconic building, which covers 2.5 acres of Covent Garden. Giving an overview of the huge backstage area, the historic Front of House and the stylish Paul Hamlyn Hall, the tour provides an intriguing insight into the world of theatre beyond the main stage. It informs visitors on the state of the art technology used for productions and provides the opportunity to see The Royal Ballet in class or a production workshop (dependant on theatre schedules). Or, for those interested in architecture, a second tour can be taken which focusses solely on the story and architecture of the current theatre. Built in 1858 after the previous theatre on the site burnt down, the Royal Opera House has charming period character and with the grand rich red curtains on the stage, the glittering gold proscenium arch and the red and gold lights, it is a truly remarkable sight. Plus, hear stories of the famous opera singers who have performed on the stage and find out exactly why there is such a narrow door through to the backstage. A further London theatre that opens its backstage doors to the public is Shakespeare's Globe. Founded by actor and director Sam Wanamaker, the Globe as it's seen today is a reconstruction of the original Elizabethan playhouse built in 1599, which was destroyed by a fire in 1613. Built approximately 230 metres from the original site, the theatre opened to the public in 1997 with a performance of Henry V. It has since continued to stage productions dedicated to Shakespeare's work and the playhouse in which he wrote. Through the use of special effects, sword fighting and costume dressing, Shakespeare's Globe holds tours that revive the theatre into the notorious entertainment district it once was, surrounded by rowdy taverns and bawdy houses. The guides touch upon stories of the 1599 Globe, the reconstruction in the 1990s and how the O-shaped theatre works today as a unique and experimental performance venue. From cheap budget accommodation to luxury 5 star suites see our discounts for hotels, including Grange Blooms Hotel London from 57% off.